Elgg comes with advanced user management and administration, social networking, cross-site tagging, powerful access control lists, internationalisation support, multiple view support (eg cell phones, iPhone), an advanced templating engine, a widget framework and more. 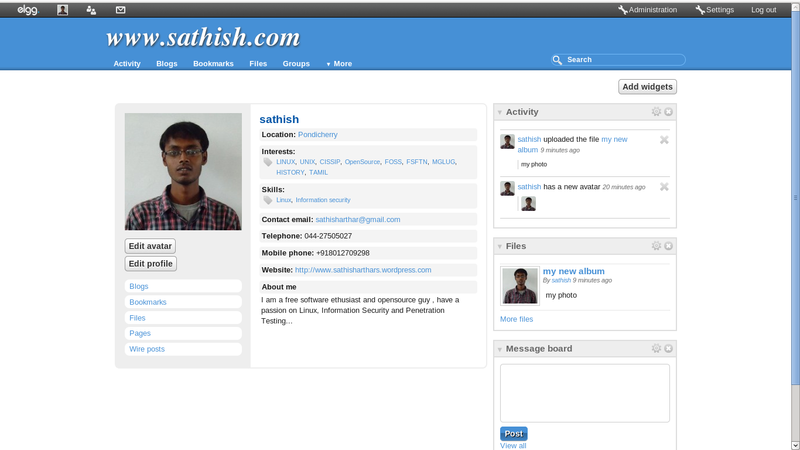 It offers blogging, microblogging, file sharing, networking, groups and a number of other features. Elgg is free to download and use. 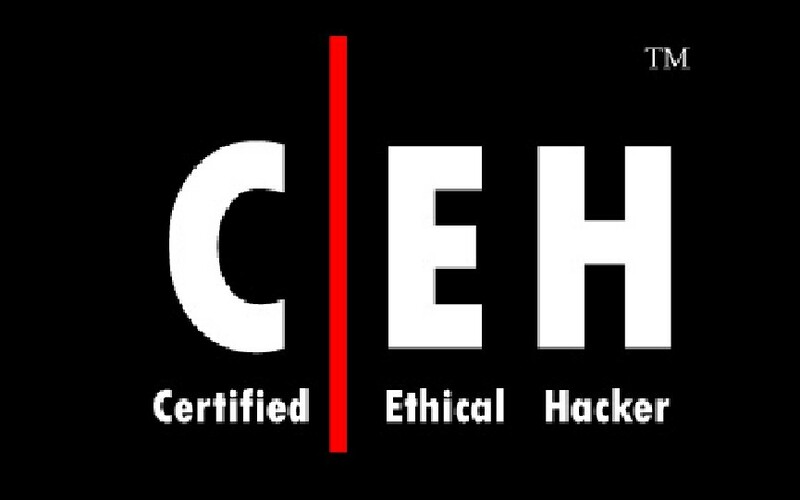 It is dual licensed under the terms of the GNU General Public License (GPL) as published by the Free Software Foundation and the MIT License. 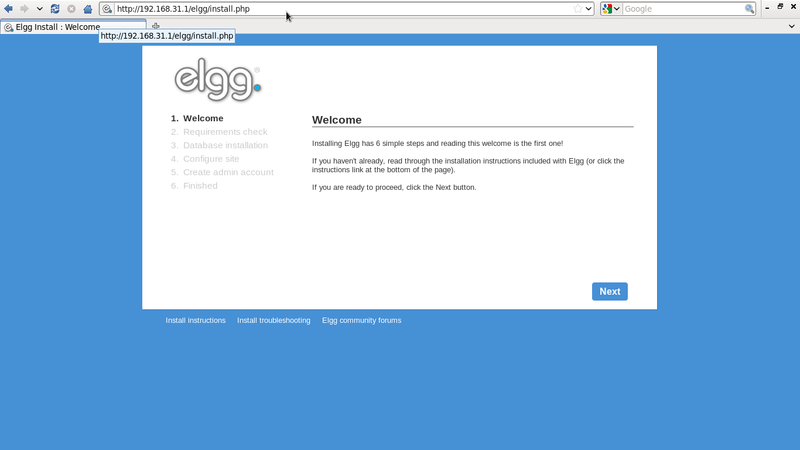 Elgg runs on the LAMP (Linux, Apache, MySQL, and PHP) platform. 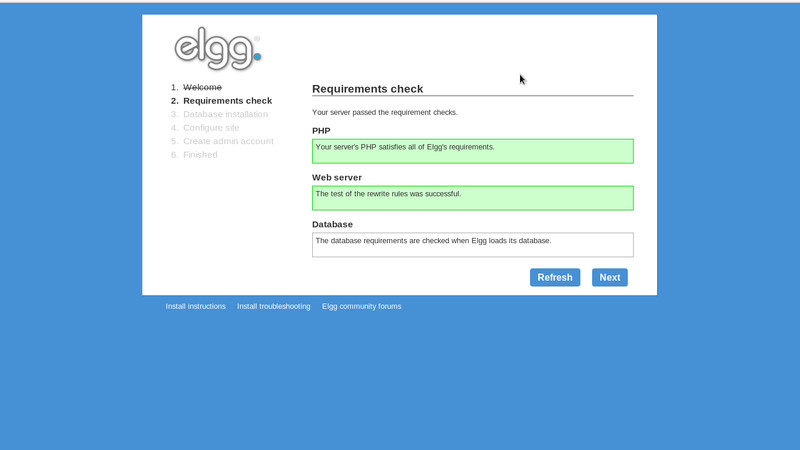 Use Elgg’s powerful plugin API to build and add your required features. 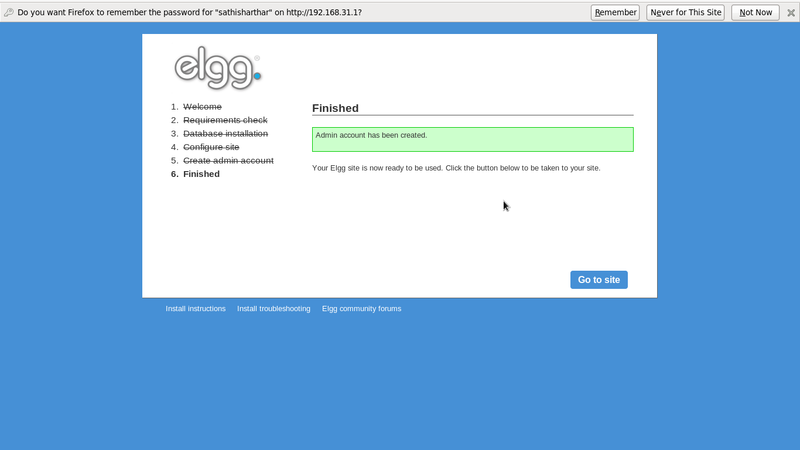 To run Elgg, you need to have your own web server . Elgg runs on a combination of the Apache web server, MySQL database system and the PHP interpreted scripting language. This is the most popular web server environment in the world. Hence Elgg depends on PHP, MySQL and Apache, it is must to have a working LAMP stack. To install LAMP server, refer the following link. 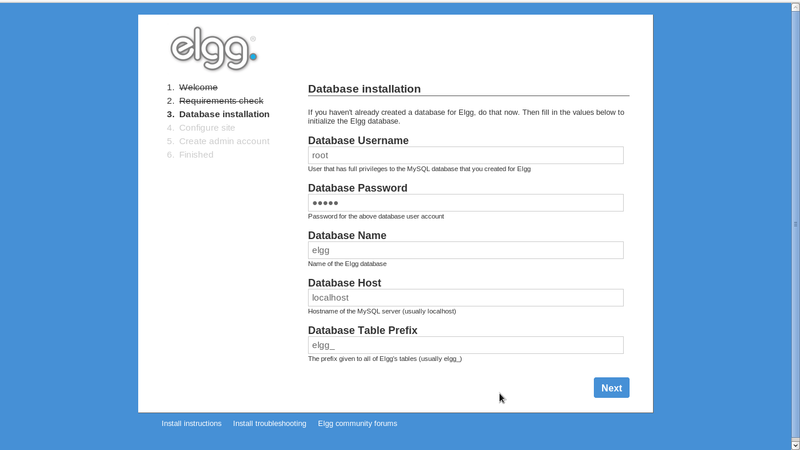 We have completed all the prerequisites, now start installing Elgg. It is recommended that you increase the memory available to PHP threads beyond the standard 8 or 12M, and increase the maximum uploaded filesize (which defaults to 2M) in /etc/php.ini . We have done with configuration, Let us log in to Elgg. Navigate to http://ip-address/elgg. 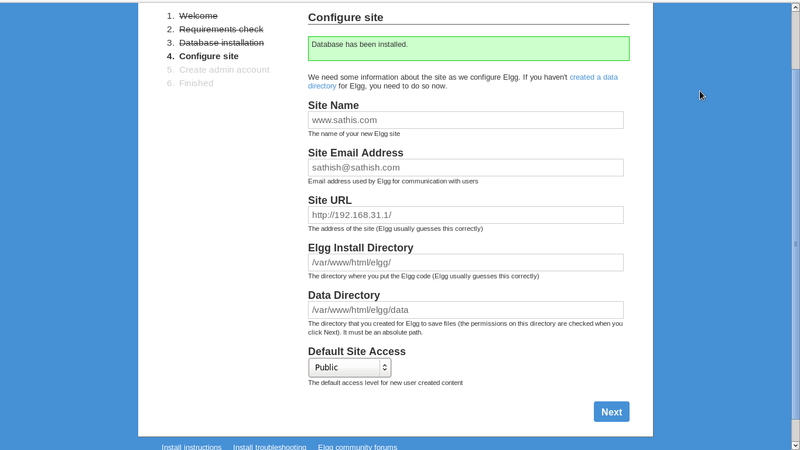 Now enter the Site Name, Site Administrator email ID and data directory path as shown below. Click Next. 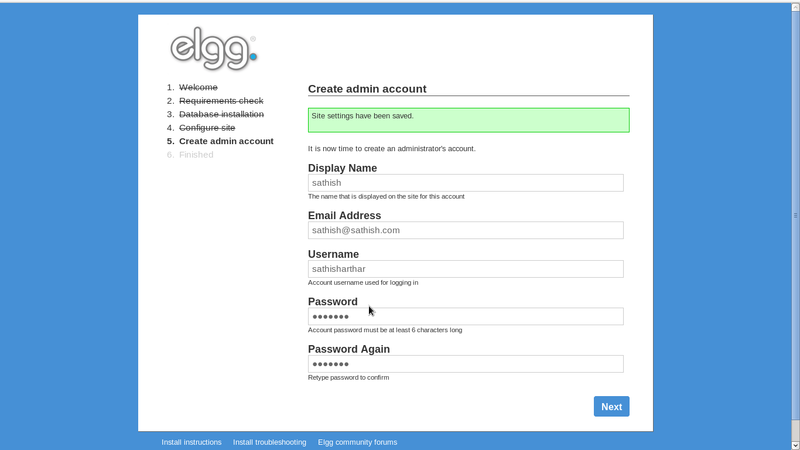 Now create the Admin account for elgg. Fill up details and click Next. Now your new social network has been created. Click Go to site to get started. Now login with user recently created. This is how your Administration Dashboard will appear for my site.From here, the users can create new blogs, pages, files, groups and so on. 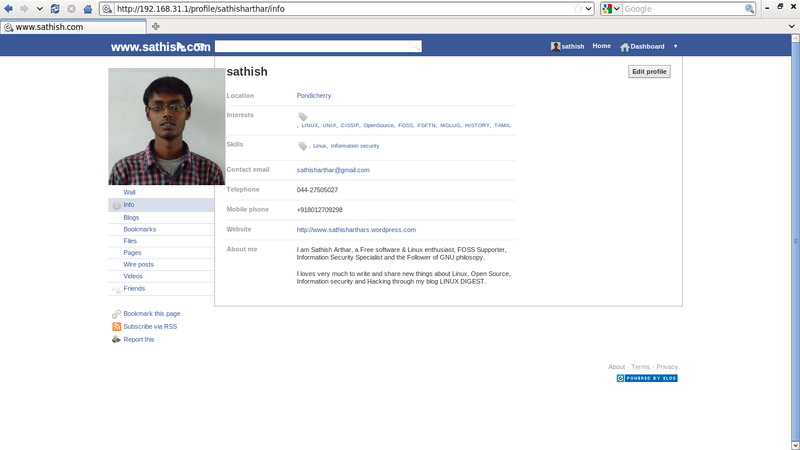 Then i installed some plugins and modified some settings in admin panel, which look like facebook.